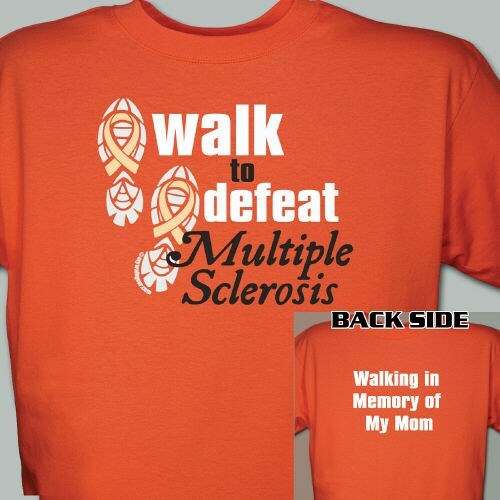 Support your loved one on every MS Awareness Walk with your personalized Walk To Defeat Multiple Sclerosis Awareness shirt. Each Personalized t-shirt proudly displays who you are walking for with loving compassion. Your unending support and commitment helps fight against Multiple Sclerosis. Nice quality. Ordered from here before. Never disappointed. Bought this shirt last year for WalkMs and put my team name on the back. The quality is great and my team expanded so I’m glad the shirt was still available. I was looking for shirts for the MS walk in New Orleans and i found i could get them from My Walk Gear in time for the walk and have team on the back. I was very pleased with the shirts. Plus the donation to the walk was a great addition to the purchase..
MyWalkGear.com has many additional Personalized Multiple Sclerosis Gifts for your special gift giving needs.